Changing Oil + Lucas Oil Stabilizer! Yesterday I took the day off to rest and get some things done that I had been putting off…one of them was changing the oil in my 2002 Toyota Tacoma. This truck is 10 years old with 106k miles on it…I have really put some preventive maintenance into it over the past year – new tires, changed the timing belt, new spark plugs, and a new muffler. These trucks are known for going 300k+ but the oil should be changed regularly. I usually just run the truck up to a Jiffy Lube for an oil change but will never do that again. I decided to roll up my sleeves and get a little dirty. For the same price of going to Jiffy Lube I bought a better name brand oil and a nicer oil filter, not to mention the Lucas Oil Stabilizer. I am really happy about this little adventure. The project was super easy, I learned more about my truck and it is running better than ever before! I heard and felt a difference in my engine performance after putting in the Lucas Oil Stabilizer. Always read your owners manual and make sure you buy and use the right kind of oil, my Tacoma takes SAE 5w-30. You should never switch weights of oil, switching brands is okay but shouldn’t happen very often. 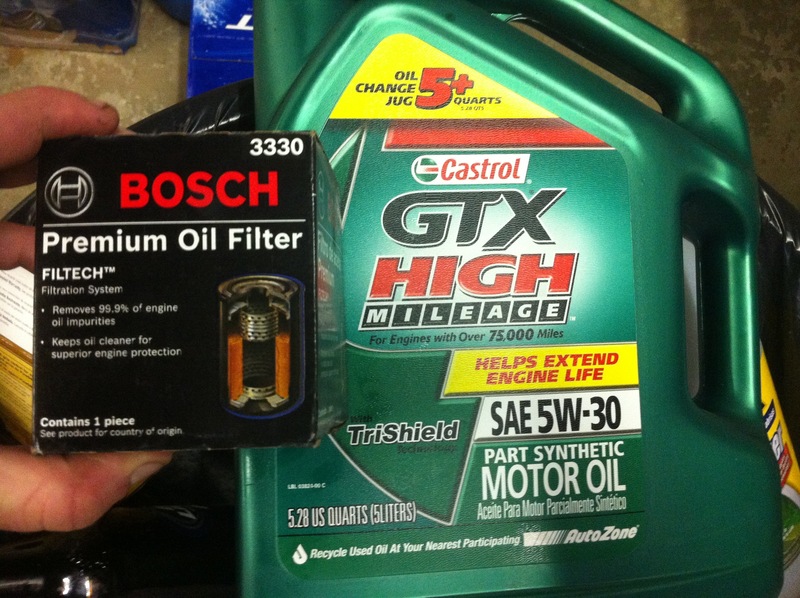 I just made the switch from Pennzoil to Castrol GTX High Mileage. Get my adventures in life delivered via email. Sign up in the top right corner of this page.